They deceive themselves who speak self-confidently that they know men well enough and that they do not allow themselves to be deceived. Who can know what kind of spirit is in man except only God, Who knows the secrets of the heart? Even the great saints were mistaken about people. For example: for a long time St. Basil considered a certain hypocritical heretic as a holy man and defended him from many attackers until finally, convinced of the heretic's falseness, Basil was bitterly disappointed. St. Gregory the Theologian had baptized a certain philosopher, Maximus by name, and liked him so much that he kept the philosopher in his home, sharing his table with him. However, this Maximus, was as dangerous and cunning as a serpent. 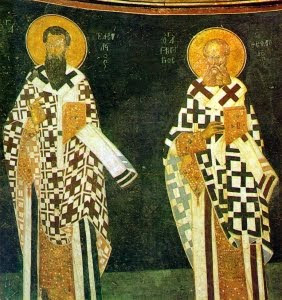 After a period of time, through intrigue and bribes, he obtained recognition of some Constantinopolians as patriarch, in place of St. Gregory. When this temptation, after great confusion, was removed, some rebuked Gregory for keeping his greatest enemy with him. The saint replied: "We are not to blame if we do not discern someone's evil. God alone knows the inner secrets of man. And to us is commanded by law, that with fatherly love, to open our hearts to all who come to us." A non-malevolent man cannot easily understand the malice of a malevolent man.